VATICAN CITY - The traditional nativity scene in St. Peter's Square won't be so traditional this year. For the first time, it is made of sand - 720 tons of it. 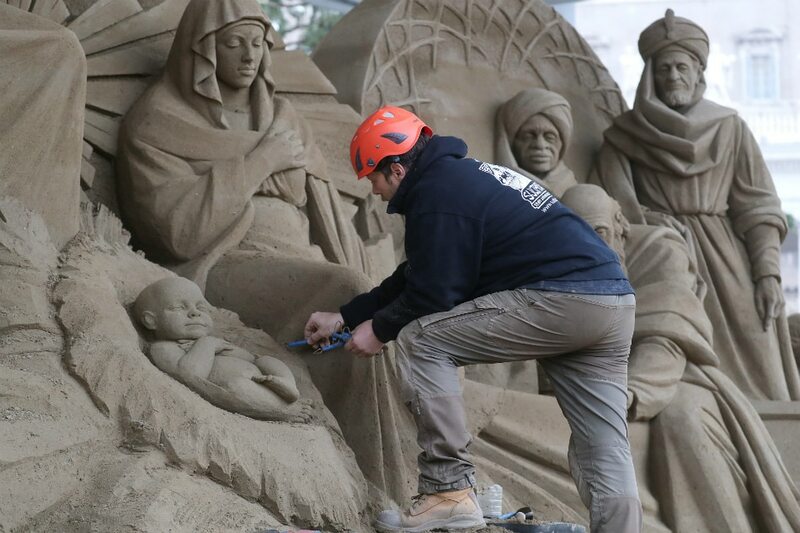 For the past 2 weeks, Rich Varano, a professional sand artist, has been guiding 3 sculptors from the Netherlands, Russia and the Czech Republic, to craft the work, which measures about 5.5 meters high by 16 meters wide (18 feet high by 52 feet wide). Varano, 60, the artistic director of the massive work, doesn't mind if you call him "Mr Sandman." Sand is his life and love. The American from Florida divides his time between the United States and Italy. "It's very special to be making one here in a place with so much history, so much culture, so much art and in the shadow of such masters," he told Reuters on Thursday as his team worked quietly to finish ahead of Friday's unveiling to the public. "It is an incredibly humbling experience to be here," he said. "What separates us professionals and the average person playing on the beach is that we understand how to make sand stick together well," the white-bearded Varano said, wearing a yellow hard hat. The scene consists of Joseph, Mary, the infant Jesus, angels, shepherds, animals and the 3 wise men, kings the Bible says followed a star in the east that led them to Bethlehem. "It's an ephemeral art in the sense that it is not intended to last forever," he said, "even though we could make it last indefinitely if we wanted to". "I would not be surprised if there were some people who had concerns, but there are so many more who will enjoy it and that makes me happy," he said.